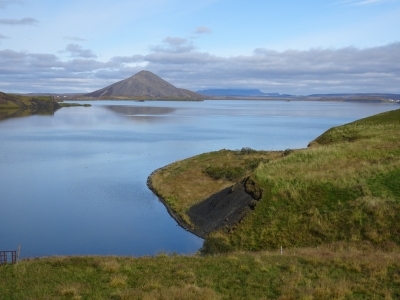 Mývatn and Laxá is part of the Tentative list of Iceland in order to qualify for inclusion in the World Heritage List. Skutustadagigar: An area of the lake shore with a lot of the typical pseudocraters. Nice views and a pleasent walk, if you don't mind the swarms of flies chasing you (Views 3/5, Flies 5/5). Dimmuborgir: A lava field next to the lake, with enormous lava rock towers to walk amongst. Crowded with tourists, but most do not advance far from the shortest walking circle (Views 5/5 Flies 4/5 at parking, 1/5 at church rock (most distant point)). Hverfjall: A hill-sized ash crater, which can be climbed for views and bragging rights. Too strenuous for me. Grjotagja: A nice little natural hot water grotto, about 10min. from the lake. Bathing is no longer allowed, and it can get overcrowded, still worth it in my opinion (Views 4/5, Flies 2/5). Nature baths: Hot water springs, about 10min. from the lake. Fully developed with spa building and entrance fees, so not too much nature. Not visited. Namaskard: A geothermic area with fumerols and mud pools, devoid of all plant life. Not too spectacular, but athmospheric and really nice for pictures (Views 4/5, Flies 1/5). In the WHS application, only the pseudocraters are mentioned, the rest of the geological side attractions are not considered. Instead, the description concentrates on the biological richness of the lake, which is hard to evaluate as a normal traveller. Visiting in early autumn after the breeding season, I could not detect major differences between Myvatn lake and other lakes in iceland. It's also hard to appreciate the duck variety when you are covered with flies. All in all, the visit to Myvatn lake was surely worthwhile and a nice experience, although maybe not among the top experiences in iceland. As with many natural WHS, I lack the knowledge to be able to judge the core worth of the site.